The HP 6200 i5-2400 desktop contains elements that are designed to meet rigorous business standards. Powering this desktop is an Intel Core i5-2400 quad-core processor, which can reach speeds of up to 3.1GHz. Complementing the processor is a 4GB DDR3 RAM that provides users with sufficient enough speed and memory to handle advanced business tasks with ease. With a maximum RAM capability of 32GB, there is room for users to upgrade it if need be. It also has storage is taken care of with a 500GB HDD, and in case that is insufficient, one can either tack on an external drive by connecting it to one of the USB ports, or utilize the DVDRW optical drive as a means to store data. Preinstalled onto the 6200 is a Windows 7 Professional 64-bit Edition, which is capable of running most applications with ease. Other elements found within the desktop are an Intel Integrated HD Graphics chipset and a Realtek ALC261 audio codec. And with these components squeezed into a small form factor, it maximizes the workspace in the workplace. Since this 6200 Pro 3.10Ghz is of the refurbished variety, HP made sure to have this tested at least twice before it is made available. 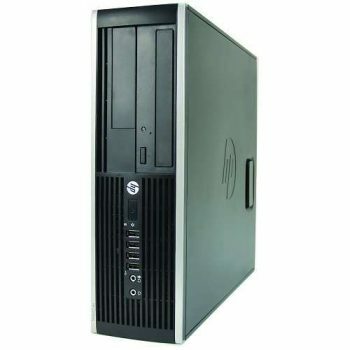 The HP 6200 Refurbished desktop comes with a limited one-year manufacturer’s warranty. Place your order here at TigerDirect today for the best prices online!